Losing hair can be a distressing experience for many people, but treatments are often ineffective, expensive or riddled with side effects. Could this development change that? A study from Colombia University has shown blocking a certain family of enzymes can rapidly restore hair. The enzymes are called the Janus kinase (JAK) family, and two drugs have already been approved for blood diseases (ruxolitinib) and rheumatoid arthritis (tofacitinib), and are also undergoing other clinical trials. 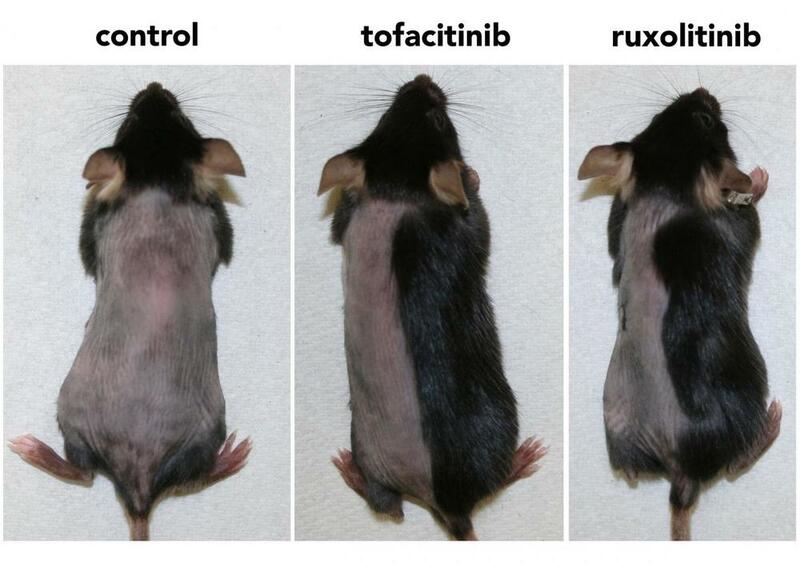 The team made the finding when studying a disease called alopecia areata, in which immune cells attack hair follicles. They found that an oral dose of these JAK inhibitors can prevent this onslaught and restore hair growth. When they tested formulations topically, applied directly to the skin of mice, it had an incredible 'awakening' effect on dormant hair follicles. "There are very few compounds that can push hair follicles into their growth cycle so quickly. Some topical agents induce tufts of hair here and there after a few weeks, but very few have such a potent and rapid-acting effect." Results look encouraging, but as per usual the drugs would need similar testing on human patients to see whether they produce the same effect. The scientists are hopeful they'll see an effect in people however, and provide a solution for the millions of people struggling with hair loss. We Can Now Edit Our DNA, But What Are The Implications?